Enhance brand awareness and remind brand’s message with the largest DOOH network. Maximum reach and frequency with 200 oversized screens of the largest DOOH network situated at strategic locations Bangkok-wide. The largest upcountry network of 116 screens at key locations nationwide. High exposure across the country. The world’s largest interactive screen at central world. Attract tourists from around the world with daily lighting and sound show. A perfect branding opportunity to generate the viral for higher level of engagement. Explore your creativity with innovative digital display. The most iconic landscape of Bangkok with remarkable and state of the art digital platform at Siam Paragon and interchange 21. Attract the attention from the shoppers and tourists with the epic media at Bangkok’s fascinating landmark. A powerful and impactful visibility from inbound and outbound of Srirat expressway in high traffic which provides very high ad recall. 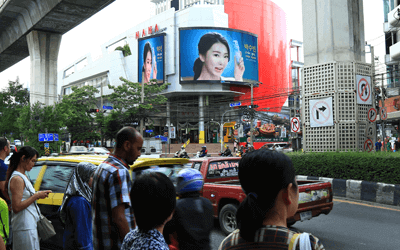 Create brand impact and engage the audience’s attentions with the largest twin vertical screens at Rama 4 road. 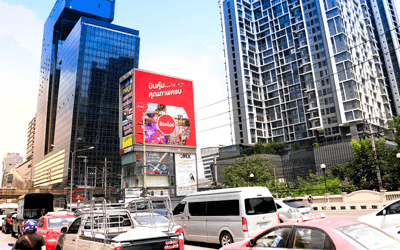 THE PRIME DOOH NETWORK IN BANGKOK. Reach and repeat the frequency of audience travelling route with 42 large screens at the best CBD locations. 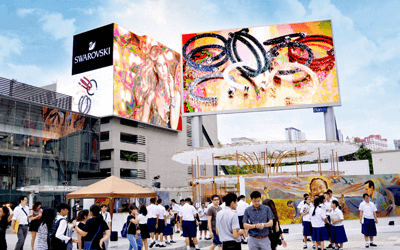 Advertisement customization with location – based and time – based by 50 digital screens on major roadways in inner Bangkok. Draw attention with smart traffic sign, estimated travel time and accident report. Opportunity to generate brand awareness and remind brand with 35 compact screens at key locations throughout the city.